BPM Labs The Delta Zone is a super potent sleep and recovery formula designed to help increase muscle, libido, enhance mood and relaxation. Contains scientifically validated ingredients like D-Aspartic Acid (DAA). The Delta Zone is the solution to this more elusive sleep market whilst increasing Human Growth Hormone release. The Delta Zone is recommended to be taken before approximately 30 minutes before bed. BPM labs has spent the past year or so refining and updating their range, and we have seen a number of new and reformulated products as a result of these efforts. 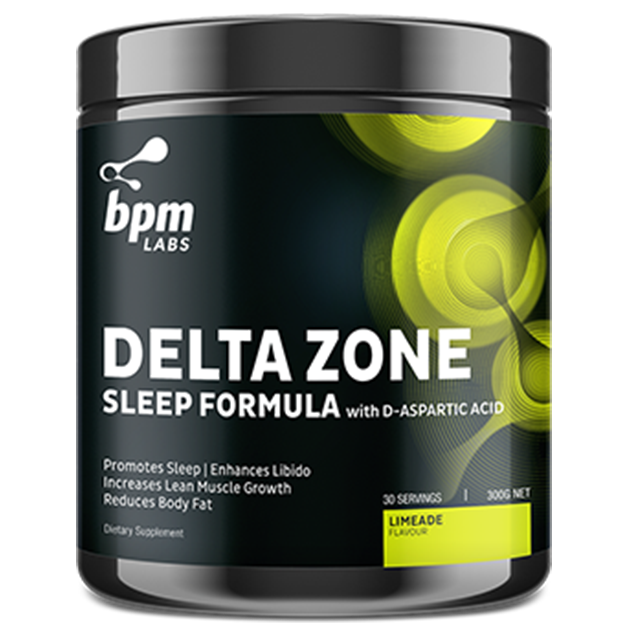 The next BPM product to appear is The Delta Zone, a sleep supplement designed with muscles in mind. Let's take a look. The Delta Zone contains a number of ingredients blended in a 10g proprietary formula designed to manupulate hormone and neurotransmitter production, promising a restful sleep and lean muscle growth. Sleep is not the only bed-based activity that The Delta Zone claims to enhance, and testosterone stimulating D-aspartic acid is included to boost libido. Arginine is included for its ability to influence growth hormone release, and dopamine-boosting ingredients Mucuna pruriens and tyrosine, and GABA-boosting kimchi extract are also claimed to boost growth hormone levels. On top of this, The Delta Zone boasts phenylalanine as a muscle relaxant and sleep aid, phenibut, which is a potent GABA analogue and relaxant, and vitamin B6, which boosts neurotransmitter production. As far as sleep supplements go, BPM Labs covers a lot of territory. Not just a relaxant, this product also claims to boost libido, enhance levels of growth hormone and testosterone, increase muscle mass and help trim fat, and if that wasn't enough, it's going to make you feel good as well. This is probably the most ambitious product of its type on the market, and the combination of benefits is going to be very popular with an eager market. It is clear the BPM Labs has done their homework, as the company has made great use of some scientifically backed ingredients, like D-aspartic acid, which has been shown to raise testosterone levels in human clinical trials, and amino acids tyrosine and phenylalanine, which are the precursors to neurotransmitters, including serotonin, the 'feel good' chemical, and melatonin, which is the hormone that controls our sleep/wake cycles, or Circadian rhythms. BPM Labs is a company that strives to produce unique, game changing products, and they've achieved this with the clever use of botanical extracts in The Delta Zone. Mucuna pruriens, or Velvet Bean, is an intriguing plant that has been the subject of a great deal of study for its ability to produce dopamine precursor L-DOPA. Mucuna pruriens has not yet been utilised by many supplement manufacturers, and BPM is the first supplement company to use kimchi extract in a product. True to their mission, the company is placing themselves in a league of their own with their unique use of ingredients. We always prefer it when a company is completely transparent with the dosage of each ingredient, which makes it unfortunate that BPM labs has opted to go with a proprietary formulation for The Delta Zone. The 10g overall dosage is generous, and makes it possible that the individual ingredients are well dosed, but we have no way of knowing for sure. While some people find phenibut safe and effective, other people choose to avoid this ingredient, because it can produce a very unpleasant 'hangover' effect and has addictive potential. Because The Delta Zone contains a number of ingredients that can manuipulate hormone and neurotransmitter levels, it has the potential to react severely with a number of medications, including common antidepresssants and thyroid treatments, and anyone with a pre-existing illness of any sort is advised to consult their doctor before using this supplement. The ingredients in this supplement are potent, and this is something that is reflected in the taste of the supplement. The limeade flavour, however, works to disguise the natural flavour of the ingredients and was a clever choice. The Delta Zone mixes very easily into water with a small amount of stirring. BPM Labs The Delta Zone is an intelligently formulated supplement that combines scientifically backed ingredients with those that are right at the cutting edge, to make a product that is a lot more than just a sleep supplement. The super potent ingredient blend won't be everyone's cup of tea, but many people will enjoy the serious results this supplement has the potential to bring.